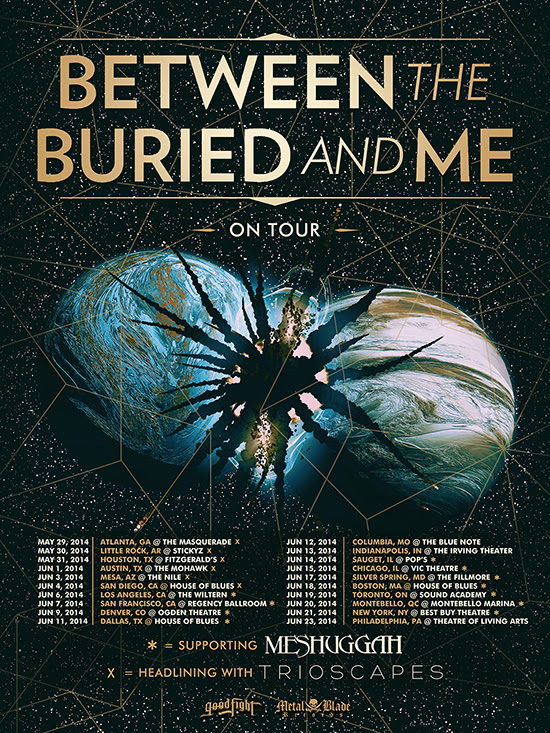 Between the Buried and Me (BTBAM) previously announced that they will be joining Meshuggah for their 25th anniversary tour across North America. Now, in addition to those shows, BTBAM will be performing a select few headlining shows on their way out to kick off the Meshuggah tour in Los Angeles, CA. Beginning on May 29, fans will see BTBAM make their way to the west coast with Trioscapes serving as direct support. Trioscapes features BTBAM bassist Dan Briggs and released their debut album on Metal Blade Records last year. The band also features Walter Fancourt (saxophone) and Matt Lynch (drums). BTBAM‘s lineup is rounded out by vocalist/keyboardist Tommy Rogers, guitarists Paul Waggoner and Dustie Warring, along with drummer Blake Richardson. The ambitious concept album, “The Parallax II: Future Sequence,” was the North Carolina-based band’s highest Billboard chart position (#22) since their inception in the early 2000’s. The album also landed the #3 spot on Billboard’s Hard Music Album chart, as well as #8 on the trade magazine’s Rock Album Chart, at #5 on Billboard’s Indie Label Album chart and at #10 on the Billboard Indie Retail Album chart. Additionally, the album landed at #18 on Guitar World Magazine‘s top 50 albums of 2012 list. Between The Buried And Me‘s ambitious concept album, “The Parallax II: Future Sequence,” was the North Carolina-based band’s highest Billboard chart position (#22) since their inception in the early 2000’s. The album also landed the #3 spot on Billboard’s Hard Music Album chart, as well as #8 on the trade magazine’s Rock Album Chart, at #5 on Billboard’s Indie Label Album chart and at #10 on the Billboard Indie Retail Album chart. Additionally, the album landed at #18 on Guitar World Magazine‘s top 50 albums of 2012 list. “The Parallax II: Future Sequence” can be purchased from the Metal Blade Records webshop & is available digitally on iTunes and Amazon MP3. This entry was posted in METAL and tagged Album chart, Between The Buried And Me, Billboard, Billboard chart position, Blake Richardson, BTBAM, Dan Briggs, Dustie Warring, Matt Lynch, Meshuggah, Metal Blade Records, Paul Waggoner, Tommy Rogers, Trioscapes, Walter Fancourt. Bookmark the permalink.